Fletchling in game: 11,832 Who? Important notice! Pokemon Fletchling is a fictional character of humans. Fletchling (Japanese: ???? Yayakoma) is a dual-type Normal/Flying Pokémon introduced in Generation VI. Fletchling are said to be very friendly and are well known for their beautiful songs. They communicate by using chirps and moving their tail-feathers to signal one another. In spite of their typically peaceful disposition, they are relentless in battle and very territorial, attacking perceived threats mercilessly. Fletchling made its debut appearance in Kalos, Where Dreams and Adventures Begin! under the ownership of Serena's mother, and it reappeared in Lumiose City Pursuit! and A Battle of Aerial Mobility!. A Fletchling appeared in Breaking Titles at the Chateau! under the ownership of a Trainer named Chester. Clarice has a Fletchling which first appeared in A Showcase Debut! participating in the Coumarine City Pokémon Showcase. Three Fletchling appeared in the Hoopa's Surprise Ring Adventures short Flying in the Air. Multiple Fletchling appeared in Volcanion and the Mechanical Marvel. 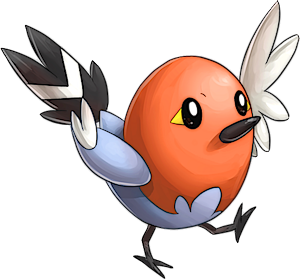 Six Fletchling appeared during a flashback in The Legend of X, Y, and Z!, with one under the ownership of a Trainer, three of them being wild, and the other two appearing as paintings on a wall. 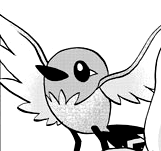 A Fletchling appeared in SM008. 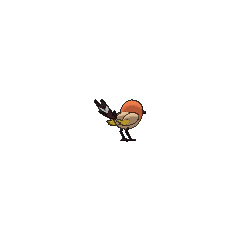 Y owns a Fletchling named Fletchy, which first appeared in An X-cuse to Come Out and Play. She was seen with her Trainer as Y tried convincing X to get out of his house. She later evolved during a battle against several Sky Trainers that were controlled by Celosia's Aegislash. Fletchling appears as a Poké Ball summon. It will jump around and peck opponents. It can fly to reach nearby platforms or come back to the stage if needed. Yayakoma may be a combination of ? ya (arrow), ?? yayako (baby), and ?? komadori (Japanese Robin).